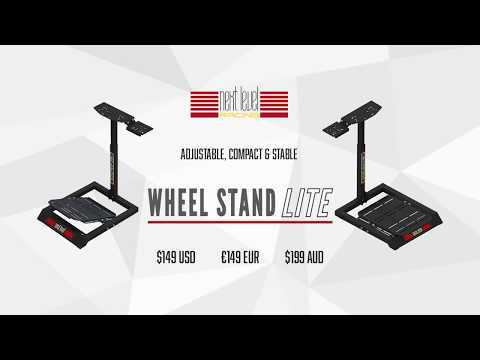 The Next Level Racing® Wheel Stand Lite is a solid and highly adjustable stand for all major wheels, pedals and shifters. With completely adjustable wheel height and angle and even pedal distance and angle. I replaced a homemade stand with this one and have to say it is a great upgrade. Mine was wood and had too much give to it. This is so stable you can forget about the stand and just drive. I was actually surprised that this stand worked out as well as it does. Nice quality, nice fit, good price. What else can I ask for? Came mostly assembled very easy to set up and nice and sturdy well build and fully adjustable I am 6'2" and it fits me perfectly. Strange that Thrustmaster added bolt holes on the pedals which you can mount to the foot plate with bolts they provide (lots of bolts for different wheels/pedals) but not to the wheel itself the normal locking mechanism on the TMX wheel locks right onto the base tightly but I wish Thrustmaster would have put bolt holes on the wheel. Only problem I am having is with my chair this thing is so sturdy and sits where you put it that I am constantly rolling away from it need to find a way to lock my chairs wheels lol. My husband loves this product!! For the money one spends and expectations going with it, this is well worth the money. No more Jerry rigging a wheel to random pieces of furniture. And it's incredibly sturdy too. I've had it almost a year now and it's still just as solid and gets used more than ever.